Combine Ramen Base and stock in a medium pot over medium heat. Bring to a simmer and cook gently until ready to use. Do not boil. Meanwhile, bring a separate small pot of water to boil over high. Add eggs and cook 7 minutes. Remove eggs to a small bowl, reserving boiling water; run eggs under cool water for 30 seconds. Set aside. Add noodles to boiling water and cook until al dente. Drain noodles and divide between two shallow bowls. Add bok choy to simmering ramen base and cook 2 minutes. 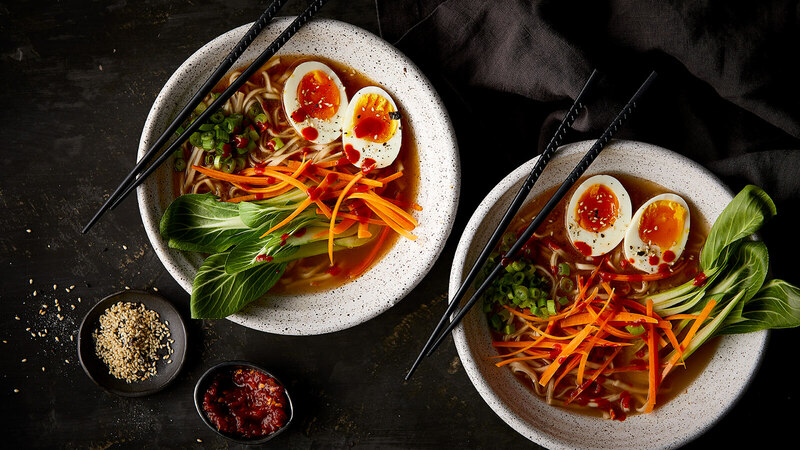 While bok choy cooks, peel eggs and place in each bowl along with noodles. Divide carrots and green onions between bowls. Remove bok choy from pot and add to bowls. Gently pour hot ramen soup base into bowls, about 1 ½ c each. Serve with soy sauce, rice vinegar, Sriracha and bean sprouts. Taste and add salt if necessary.